The Zira® series is a contemporary solution that offers an extensive range of components to accommodate any space. Dark Espresso finish. 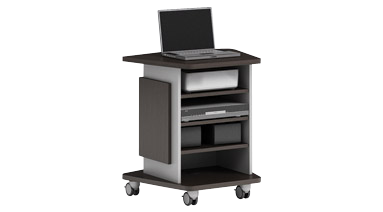 28"W x 22-1/4"D x 29-1/2"H. Multimedia Cart. Features non-locking hinged door on back, three fixed shelves and 2 grommets for cable management. Includes four locking casters.